Our new 2018 Art Poster to be announced soon! LIMITED QUANTITIES AVAILABLE ON PREVIOUS POSTERS. Art Poster 2016 price: $20 ea plus $8 shipping. Make check out to SFR-VHD. Mail to: SFR-VHD, P.O. Box 626, San Juan Bautista, CA 95045. Shipped within U.S. & Canada only. Art Poster size: 18-1/2" x 11-1/4". Ships in a tube. Our 2014 Art Poster is available in limited quantities via mail while they last. Shipped within the U.S. & Canada only. The art poster design features sketches by artist Jo Mora (1876-1947) for "Dawn and the Dons" by Tirey L. Ford, 1926 along with text excerpts from the original publication. "Happy Days were the equestrian days of the Californios!" The 2014 Posters are $20 each plus $8 shipping. Poster size 11 x 17 and ships in a tube. Send check for $28 made out to SFR-VHD, mail check to SFR-VHD, P.O. Box 626, San Juan Bautista, CA 95045. Orders shipped to U.S. & Canada only. 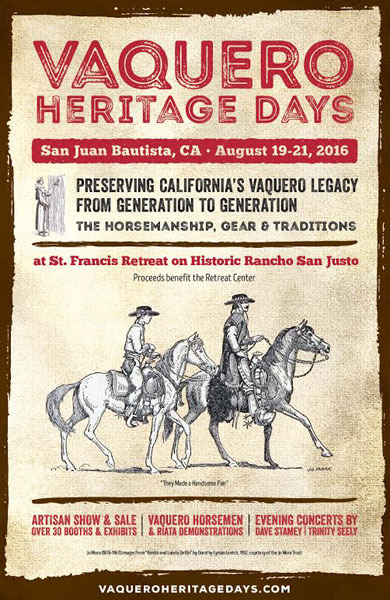 Proceeds benefit St. Francis Retreat, home of Vaquero Heritage Days events. Our 2012 Ltd Edition, numbered "Jo Mora" Art Poster is available in very limited quantity via mail while they last. 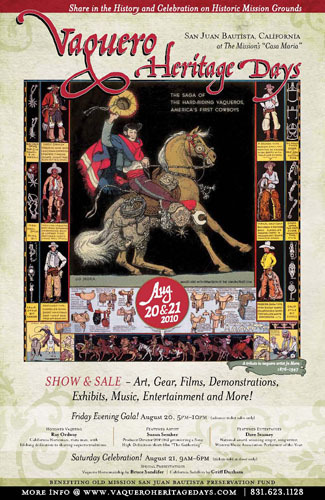 A collector poster created by Hatch Show Print. Hatch Show Letterpress is the oldest print shop in America, founded 1879. Located in Nashville, TN it runs exactly the same as it did in the beginning - using original wood blocks, each print hand cranked, inked & trimmed. We are honored to have our 2012 poster produced by Hatch Show Print. Poster Size 18-1/2 x 11-1/4. ORDER by mail only with check. No charge cards. Price for 2012 Poster: $25 each + $8 shipping, U.S. & Canada shipments only. 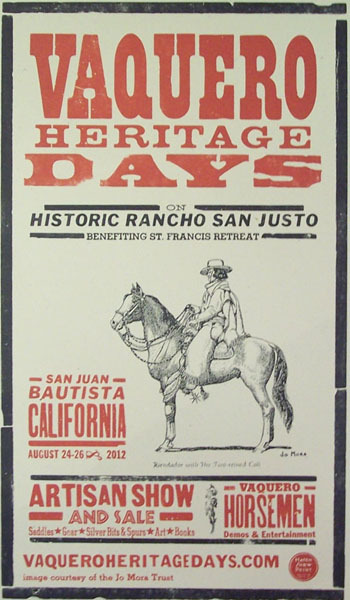 Proceeds benefit St. Francis Retreat on historic Rancho San Justo. Make check out to SFR-VHD. $33.00 U.S. funds, shipped within U.S. & Canada. Poster will ship in tube. DO NOT store in the tube. Remove & lay flat. 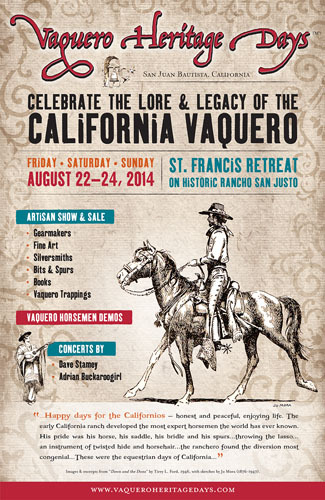 The 2010 Vaquero Heritage Days Art Poster is available in limited quantity via mail. It features the art work of Jo Mora (1876 - 1947). We honor artist Jo Mora at Vaquero Heritage Days. Order by mail with a check. Price for 2010: $20 each + $8 shipping, U.S. & Canada shipments only. Make check out to for $28 U.S. funds to Southwest Roundup and mail to P.O. Box 626, San Juan Bautista, CA 95045. Poster will ship in a tube within 2 days after receipt of check. Poster size 11 x 17.